Golden's Heavy Body Acrylic Colors are known for their exceptionally smooth and thick consistency. They contain the largest assortment of unique pure lightfast pigments in a 100% acrylic emulsion vehicle available. There are no fillers, extenders, opacifiers, toners, or dyes added. When dry, these colors are satin-matte in appearance. We have had many conservators request this product for tinting and glazing. 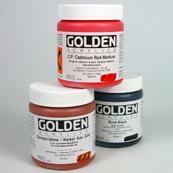 Golden's Heavy Body Acrylic Colors are packaged in 4, 8 and 16 fl. oz. plastic jars in 81 colors.